Speaking of wild times, we caught another free summer show with Long Beach Public Library on Wednesday. This time, it was El Dorado Nature Center showing off at the Dana branch in Bixby Knolls, and it was definitely an all-natural show: The curator brought bugs. Kids gathered ’round Ms. Dana from the El Dorado Nature Center for an up close and personal bug encounter Wednesday at Long Beach Public Library’s Dana branch in Bixby Knolls. Ooh, what’s in the bag? While us adults were wary of whatever was coming out of that bag, these kids were fearless and dove right in there to get a good grasp for all the creatures featured at the El Dorado Nature Center show. Yes, bugs. Why bugs?! Well, the theme of this year’s summer reading program is “Dig into Reading!” With that, Nature Center staffer Ms. Dana (that really was her name despite our location) has put together a wonderful 45-minute program focused around the creatures you might find while digging into the ground while gardening or playing in the dirt (like many kids do). These hissing cockroaches were safely behind glass the entire show (phew!). Yes, I am a wuss… when it comes to roaches anyway! Ms. Dana demonstrating how the roaches “hiss” and move while the kids watch them in their terrarium. T holding a millipede of some (large) sort during the El Dorado Nature Center show at the library Wednesday. T and the other kids looking through a tub of compost, home to several beetle and bug species. On this trip, Ms. Dana showed us a pair of hissing cockroaches, a millipede, some walking sticks, and a giant tray of compost that contained a variety of beetles and stink bugs. Most were local creatures but some were exotics, like the cockroaches (right, because I know there are some pretty large roaches here in Southern California, but if they start hissing we’re all in trouble!). The El Dorado Nature Center show was a stinkin’ blast! Here’s T and his friend with a skunk pelt. And, no, it didn’t stink. Davy Crockett has nothing on you, T.
Ms. Dana read to the kids at the end of her presentation. Of course she did; after all, the show was at the library. Ms. Dana also explained the difference between insects and bugs (insects always have six legs while bugs are the all-encompassing name for any sort of buggy creature, like the millipede, which is actually an arthropod). She had a pile of bug puppets for the kids to play with and sacks of pelts of other local animals like raccoons and skunks for the kids to pass around and touch. She ended the show by reading a book about insects and bugs to the children. T’s friend isn’t even three-years-old yet and here he is front and center with Ms. Dana letting a millipede crawl all over his arm! What a brave kid! T loves these walking sticks, always has. He first let them crawl on him at his school math and science night earlier this year. While this was a much smaller crowd than we’ve grown accustomed to in attending these summer library shows (surprising, really… where were you, Long Beach?! ), that really allowed the kids to see, touch, and learn much more than they might have otherwise. Kids got to sit in a circle right around Ms. Dana and get close-up and touch or hold anything they wanted (aside from the roaches because they “are very fast” and might run off – !). I was so impressed with all of the kids and their willingness to get right in there and meet the creepy-crawlers. I for one was plenty happy watching from a distance and capturing T’s face as he held the bugs and insects (which was priceless). Saturday July 27 – Los Altos Library – 2 p.m.
Tuesday July 30 – Twain Library – 2 p.m.
Wednesday July 31 – North Library – 2 p.m. So when the kids start pestering you for something new to go and do this summer, well, RMT’ers, don’t get antsy. Just go see some bugs! T showing off his free book for concluding the summer reading program: It’s Hard to Be Five by Jamie Lee Curtis. Great choice, T! The selection was rather impressive. The library had wonderful hard-bound picture books and other new books for readers of all-ages to choose from for their participation in the program. Long Beach Public Library’s special summer family programs come to a close next week as the Summer Reading Program for 2013 winds down. You can go here for a PDF schedule of these and other upcoming events; all shows are free and for all-ages. For more information on El Dorado Nature Center’s location, hours, and upcoming programs, classes, and events at the center, you can go here. 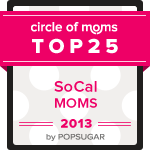 Just FIVE DAYS LEFT to vote “Real Mom Time” as a Circle of Moms 2013 Top 25 Mom Blog in So Cal! You can do so by clicking here to vote directly; or, if you want to see the whole list, click the button above and scroll through and find me to vote next to my spot on the list. You can vote once daily (every 24 hours) on your phone, tablet, or computer through Tuesday July 30 at 4 p.m. Thank you so much!